German p2p lending Smava had a high net loss for the year 2011. Documents available to P2P-Banking.com show that Smava incurred a net loss of 2.77 million Euro (approx. 3.68 million US$) in 2011; up from 1.75 million EUR in 2010. Overall loss carried forward up to the end of 2011 was 7.7 million EUR (approx 10.2 million US$). Smava did raise new capital in 2011. They had a cash reserve of 1.98 million EUR in the end of 2011. The high burn rate might have contributed to Smavas decision to change the business model in early 2012 moving away from p2p lending. No financial figures were available to P2P-Banking.com for later periods. 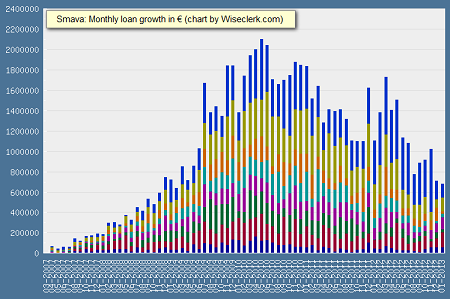 At German Smava.de the volume of newly originated p2p loans continues to fall and reached a record low of approx. 700K Euro in January. That’s only about one-third of the volume Smava funded on its peak-time in mid-2010. Smava changed its business model in spring 2012, since then focusing on brokering bank loans and the aim to rely on the commissions paid by the banks as main source of revenue rather than the p2p lending transaction fees. There are no public figures available on the volume of bank loans brokered by Smava. I do wonder if they will reach break even by pursuing that model as competition in that market is fierce. German Smava, launched 2007, yesterday announced that it will offer more products and evolve into a marketplace where borrowers seeking loans get multiple offers. The site logo and layout have been redesigned to reflect this change. Smava said p2p loans will be continued to be on offer and the new products (bank loans) added will give the borrower more choices. My take on this – what does Smava achieve with this change? can increase revenues. Since borrowers can be offered more loan terms and get multiple offers from banks, the probability of a sale increases. That bank loans need less explanations than innovative p2p loans further spurs this. Smava earns lead and sales commissions from the banks. can justify high marketing costs to acquire the borrowers better now as the resulting traffic is more efficiently monetized. Unlike before Smava no longer needs to balance demand and supply (borrower growth versus lender growth) but instead can totally focus on marketing to borrowers. Why does Smava still keep p2p lending? Are women more risk-averse then men when it comes to lending money to strangers via p2p lending services? A recent study by Nataliya Barasinska, analyzed what impact gender has on the investment decisions. In the study, which was supported by a grant by the European Commission, she looked at bidding and loan data of the German p2p lending service Smava for the time span from March 2007 to March 2010.